The trial of alleged kidnap kingpin, Chukwudumeme Onwuamadike popularly known as Evans, took a new twist today Tuesday September 12th after the suspect denied ever making any statement to the police, confessing to be a serial kidnapper. 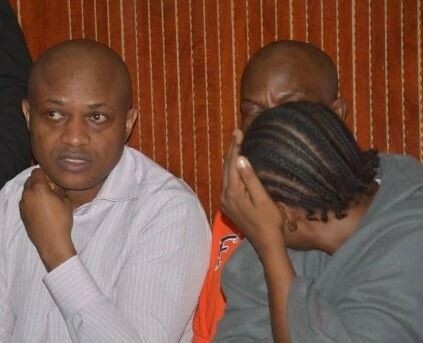 At the resumed hearing of his trial at the Ikeja High Court, Evans through his counsel, Chino Obiagu, made the denial following an attempt by the State Prosecuting Counsel, Adebayo Haroun, to tender documents containing the statement of the 1st defendant (Evans) as exhibits before Justice Hakeem Oshodi. Evans, through Obiagu, said the purported statement was not written by him neither was it voluntarily made as claimed by the police. The five suspected members of his gang namely: Uchenna Amadi, Okwuchukwu Nwachukwu, Ogechi Uchechukwu (the only female among the gang) and two Ex-Army officers, Chilaka Ifeanyi and Victor Chukwunonso Aduba, who are also standing trial with him, denied ever making any statement to the police. Their counsel, argued that the statement sort to be tendered by the prosecutor was written by a policeman, Inspector Idowu Haruna attached to Inspector General of Police Intelligence Response Team. The police officer, Inspector Haruna, who the suspects accused of writing the false statements, told the court that he wrote the statement on behalf of Evans, after he was arrested on June 2017, because he claimed he didn’t complete Secondary school and therefore could not write well in English language. Haruna, while being led in evidence, said that Evans and his gang members all volunteered their statements under caution after being charged with the offence of Criminal conspiracy and kidnapping. “I got to know the defendants when they were arrested for the kidnap of one Mr Donatus Dunu- the Managing Director of Maydon pharmaceutical company, who escaped from their custody at Igando area, Lagos. When the matter was referred to my department at the IGP Response Team, we immediately visited the scene where the abductors had held him and discovered it was a well fenced and furnished bungalow with two flats; just like any normal building. Having noticed that their victim had escaped, they gang abandoned the house before we got there. We conducted a search and discovered several Ak47 rifles (military version) and pistols which they left behind. it was through our investigation and items recovered from the building that we arrested Uchenna Amadi, who had ran to seek refuge at Port-Harcourt. Amadi, during interrogation, confessed that Evans was the mastermind and leader of their gang. This information led to the arrest of Evans at Igando area when he was about to run out of the country to Ghana. During Evans testimony, he mentioned other members of his gang like Ifeanyi and Aduba, who are former Army officers; Nwachukwu aka “Congo”-who is the agent and informant that sold information of victims to kidnap; Uchenna Amadi and his wife Ogechi. My team also made a video recording of Evans confession and narration of all his kidnapping activities before and after he came to Lagos in 2013. After volunteering their statements, it was read to them and they signed. I, however, signed as the recorder. Some of the suspects recorded their statements by themselves but I personally recorded the statement of Evans and Victor Aduba. Their statement was further read to them again by a superior police officer, CSP Philip (former DSP) and they all agreed to have volunteered without duress. Evans, however, told us that he never imagined he could ever be caught because he has no other means of livelihood apart from crime-kidnapping and armed robbery,” the witness said. Justice Oshodi thereafter adjourned the matter till October 26 for ruling on admissibility of documents and continuation of trial within trial.